Choosing new patio doors can be as easy as 1-2-3. Learn about function, style and all the details available in patio doors today. 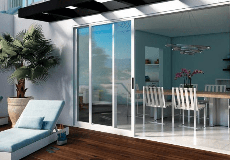 The choices are wide open when it comes to selecting new patio doors for your home. Get our free guide with tips and ideas designed to help inspire you. No - I am not interested in receiving additional information or any special offers via email. When you submit this request, we will send you a single email fulfilling your request and identifying the local Milgard Certified dealer your information has been sent to. This dealer may send you additional information pertaining to your request. You can unsubscribe from our certified dealer’s communications at any time. You must expressly opt-in to our E-news mailing list in order to receive future emails from Milgard regarding promotions and product features.